All of us Indians are very familiar with silverware, most of us have it at home but never use it. Even I was gifted a full set of silverware which included plates, glasses, spoons and pooja sets for my wedding but I never used them, as I thought it’s was too much of a luxury, remember the famous “born with the silver spoon” phrase. It is the best antibiotic known to mankind (Shocked!! Im shocked too). It heals wounds with its antimicrobial properties, some countries make bandages out of silver. It destroys all germs, virus and bacteria. Olden days silver coins were added to a glass of unpasteurized milk and milk was fresh for days. Used as filters in water purifiers (off course by the wealthy). Silver was thrown into holy water near temples to purify the river during ancient times. 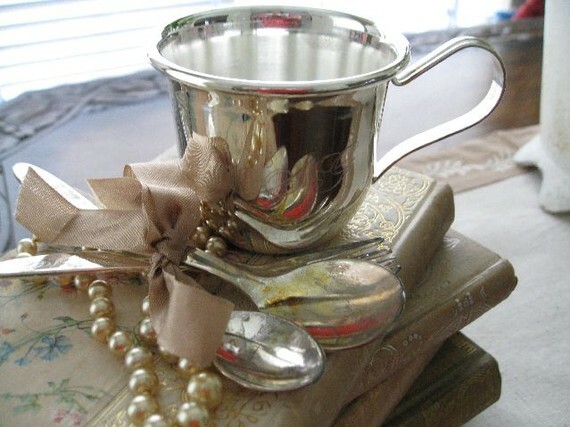 I think all of us mommies should give this a serious thought and use silverware once a day to feed our kids or give them water to drink in silver glasses. Silver is not as expensive as gold, I’m sure you all can afford some silverware if you don’t have it at home. Silverware is available in jeweler shops, I even saw some at Mom and Me stores. Hope you liked the post. This entry was posted in Baby food, Baby utensils and tagged benefits of silver for baby, india mother blog, india parenting blog, indian baby, Indian baby blog, Indian mothers blog, Indian Parenting Blog, indian pregnancy blog, indian womens blog, silver for baby, silver utensils for baby. Bookmark the permalink. This is a very useful article. I had been told about the benefits of silver that how our body needs these elements and when we eat from silver plates, some of it goes into our body. That’s the reason why there are gold and silver chyavanprash in the market. I have a big set of glass, plate, spoon, bowl in silver gifted to me when my daughter was born. Except for the glass, I don’t use anything else. May be, now is the time to start feeding my little one in it.